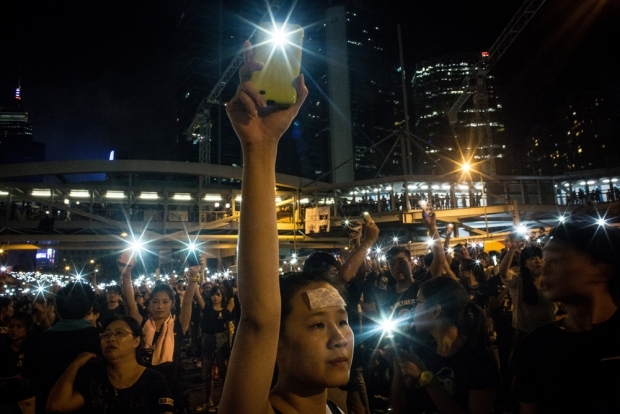 A protester holds her mobile phone in the air outside the Hong Kong Government Complex on October 1, 2014. Thousands of pro-democracy supporters continue to occupy the streets surrounding Hong Kong’s financial district. When thousands of Hong Kong protesters clashed with police on Sunday, September 28, many residents of the city immediately took to the photo-sharing platform Instagram. There, they uploaded images of police violence and demonstrations that shocked the world: smoky cascades of tear gas launched into swelling crowds, protesters wielding umbrellas to protect themselves from pepper spray, high school students struggling with riot police. These images never made it to mainland China, however, thanks to the speedy reaction of Beijing’s censors. Or did they? The government’s decision to block Instagram on Sunday triggered a huge spike of interest in VPNs, or virtual private networks, on Chinese social media in the ensuing days. VPNs are a kind of software that allows users to scale the “Great Firewall”—the collective name given to the complex system of web censorship that keeps foreign social-networking sites like Facebook and Twitter inaccessible for most Chinese netizens—meaning that scenes from the “Umbrella Revolution” surely made it onto the mainland after all. On Weibo, China’s huge microblogging platform, one September 29 post offering instructions on how to download a VPN quickly went viral: It was retweeted more than 20,000 times in two hours. Censors later removed the post, but other VPN tutorials still remain accessible. One user who posted a tutorial commented that after using the recommended method, she was “so happy to be able to use Instagram again.” With or without tutorials, it seems that many Chinese netizens were able to find what they were looking for—according to mobile app analytics platform App Annie which tracks Apple’s iOS App Store, as of September 30, four of the top 50 most popular free apps in China were VPNs. On another social media platform, a discussion forum on Instagram swiftly attracted users seeking access to the photo-sharing site. VPN tutorials posted to the forum received hundreds of comments; at one point, on September 29, forum users were posting several new VPN tutorials every minute. Social media users took note of this sudden spike in interest: On September 29, the day after Instagram was blocked, one user posted a screen shot of App Annie’s top Chinese search terms, noting that “VPNs already monopolize” the list. Not everyone expects former Instagram users to find ways around the block, though. At least one enterprising shop on Taobao, an e-commerce platform, immediately began offering Instagram photo transfer services, at the price of 15 cents per 10 photos, to allow those without Instagram access to at least recover their photos. Chinese authorities are unlikely to welcome this new surge of enthusiasm for firewall-evading software, given the great lengths mainland authorities go to in order to restrict the Internet activities of Chinese citizens. VPNs, which enable access to websites blocked within China by rerouting to a server located outside the mainland, remain legal in China, as long are they've been registered with the government—companies maintain that they’re necessary for business operations. But foreign VPNs are illegal, and the government occasionally cracks down on their use. The low number of Chinese users on such banned sites as Facebook and Twitter suggests that most Chinese residents rarely use VPNs to access blocked social media. The networks can also drastically slow connection speeds, and often charge a monthly fee for use. Another user seemed at first to think that blocking Instagram would serve to catalyze China’s young social media users, commenting, “I was going to say that the ban on Instagram will make the younger generation realize what kind of society we’re living in right now and how horrible that is.” But the user reconsidered: “With Instagram gone, there will be other apps to satisfy their need to socialize,” wrote the user. "Most people will then stop using Instagram, and the people who do will find another way."